This issue picks up from where the previous one left off and we see how Prosper and Angus, after much running around and being all Robin Hood finally take down the troll that’s been hunting them. Prosper and Angus are our protagonists after all, and it makes sense to follow up with their story in the immediate sort of way that Edginton does here. There’s a frenetic pace to the first third of the comic, and Edginton really builds up the atmosphere and the vibe to draw you in. You expect the heroes to survive, but nothing is telegraphed and the suspense is maintained throughout, so that when the end finally comes, you are surprised and elated in equal measure. And once that’s done, we move into the most exposition-laden part of the issue, where we see the White Queen of the Sidhe, elves/faeries from Gaelic mythology, and her daughter Tersia who argue about their approach to dealing with the last remnants of mankind. I kind of wish that all the info-dumping had been handled better, since what is revealed in this conversation isn’t all that revelatory in the first place. I mean, you kind of expect this kind of a twist in the tale, so there’s no surprise really. But, the value I suppose was in how much the White Queen and Tersia disagree with each other. Their differences suggest a wider rift between all the Hinterkind, even though they are both Sidhe, and I take it as a hint that where we’ve only seen the villainous Hinterkind till now, we can expect to see some good ones too. Or at least those who are more… neutral in their feelings towards mankind. The final third of the issue involves a big twist, almost on par with the final pages of the first issue. I’d say that here, Ian Edginton has saved the best for the last. Much less talking going on and the art is in full focus here, which is an approach that works really well in comparison to the conversation between the White Queen and her daughter. Prosper and Angus are both unaware of the dangers of the open wilds, and this section reinforces that inexperience. And it sets up some really good character drama for later on, which we’ll hopefully see come about in the next couple issues. Ian Edginton has presented a really interesting take on the usual sort of post-apocalyptic stories with these two issues and he is undoubtedly setting the stage for a really grand event. He is a little slow with it, almost but not quite to the point where it seems he is dragging out the story, but I have to say that I’m definitely intrigued enough to go on. With interiors from Francesco Trifogli and colours by Cris Peter, the art is once again quite decent. Given that the setting etc is all rather dark, a bit on the grim side, the colours don’t really match up since they are quite cheery and even a little bright. Some shadows and dark colours would improve the artwork since then it can all match up with the story being told. Trifogli’s pencils can sometimes feel uneven, with a lack of polish, but they are largely consistent, which is an important thing. There are flaws in the artwork, sure, but I like it all the same. 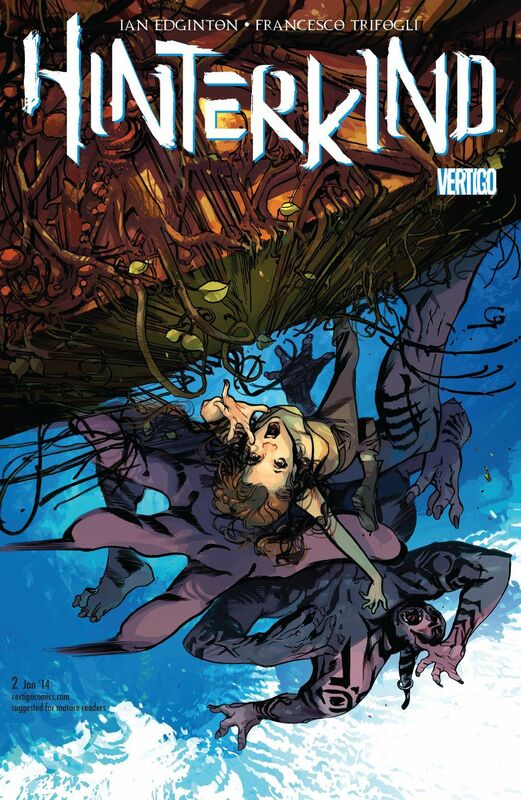 Posted on November 17, 2013, in Comics Reviews, Review Central and tagged Comics, Comics Review, Cris Peter, Dezi Sienty, Francesco Trifogli, Hinterkind, Ian Edginton, Monsters, Mythology, Post-Apocalyptic, Review, Review Central, Sidhe, Survival, Trolls, Vertigo Comics. Bookmark the permalink. 1 Comment.